Rihanna was spotted out and about NYC a few days ago in a Pushbutton tee and some new jewellery. 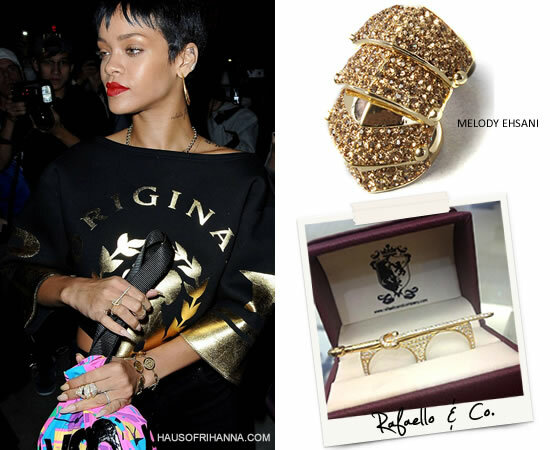 Rih has added some pieces to her arsenal including Melody Ehsani‘s crystal Armor-dillo ring in Gold. The ring costs just $45.00 and is “designed with joints that move with the bend of your finger”. She also wore a sword ring that was custom made for her by acclaimed jeweller Rafaello & Co. The Knight Me ring is just one of a few pieces that was made for her and she has worn them over the past few days.